Do you ever have days where you set out to do something that should take a couple of hours and 4 hours later, you're still trying to get it done? Making tonight's Mauritanian meal of Coconut Pepper Steak took me forever to prep, execute and deliver. It wasn't all that complicated, I just think my organizational skills completely imploded after a long week. Here's hoping that my personal failings won't be reflected in what turned out to be a really good and interesting North African meal. Many of the recipes I found called for camel, but as resourceful as I like to think I am, camel was not to be found in these parts. I'm not truly sure how often beef is eaten in Mauritania, but the recipes I found called for beef combined with hot peppers, green peppers and coconut, so if any of my readers know differently, I'd love to hear about it! 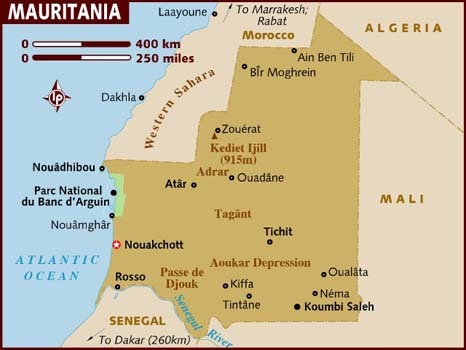 Located in North Africa, Mauritania, is bordered by the Atlantic Ocean, Western Sahara, Algeria, Mali and Senegal. The country gained independence from France in 1960, and then following a military coup that overthrew the civilian government in 2008, has since been run by General Aziz. The official language in Mauritania is Arabic, and more than 20% of the population lives on less than $1.25 per day. The climate in this beautiful country is rugged and unforgiving, yet the primary source of income for many is raising livestock such as dromedaries, which are used for transportation, meat and milk. Dates, lamb, spiced fish and vegetables, meat, couscous, rice, stews, olives and Arabic spices are all popular in this country. Because Mauritania is an Islamic Republic, alcohol is forbidden to nationals, but some restaurants do serve it in limited amounts. Goat, camel milk and tea are the most frequently consumed beverages. Add the oil to a large frying pan and add the salt, black pepper, garlic and Tabasco. Fry the peppers and chili in this seasoned oil for 2 minutes, then add the steak and fry for another 2 minutes before adding the coconut strips and frying for another 2 minutes. Mix the coconut water with enough water to make 1 3/4 cups, and bring to a boil. Add the soy sauce and beef bouillon then mix the cornflour with 1/4 cup water for a paste. Add this to the coconut water mixture and stir to incorporate. Continue stirring the mixture over low heat until the sauce thickens. Final Assessment: Surprisingly tasty and good. I wish I could have sliced the coconut even more thinly, but the dudes in residence liked the crunch of the fruit combined with the spicy meat and sauce. 6 thumbs up from my in-house food critics. Place the meat mixture on a bed of rice and spoon the sauce over the top before serving. It looks yummy!I had never guessed you would have done a meal containing beef, but I believe the country being an ex-French colony, perhaps that's why? Correct me if I'm wrong, because this is just guessing. :) Coconut usually gives a nice flavor to meals. I think you're right, Astrid - but it was the best recipe I could find on short notice! Your country is up next, hoping to cook there on Tuesday...trouble is, I'll have to decide on one of the wonderful recipes you sent! !